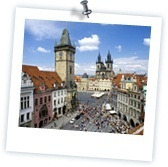 For the trip to Prague, participants of the European Studies program are accommodated at the Orion Hotel. The hotel is located just 15 minutes from the historical center of the capital. The hotel is located within a safe and quiet neighborhood. Our participants will stay in shared apartments (double rooms). All rooms are equipped with shower, toilet, wifi, microwave, refrigerator and water heater.